Os grid reference: SD9383 9013. The very well-defined almost square-shaped earthworks of Bainbridge Roman Fort, lie just a little to the east of the village on the opposite side of the river Bain at a place called Brough – hence the name Brough-by-Bainbridge. The Romans called this fort Virosidvm – ‘the settlement of true men’, or was it perhaps Bracchivm? Thought to have been built in the Late Flavian period – the late 1st or early 2nd century AD and abandoned by the late 4th century, it has a single ditch surrounding the north, east and south sides, leaving this northern military outpost in a resonably well-preserved state of preservation. An earth and stone platform has survived at the south-east side, has have a few Latin inscribed stones and a substantial amount of metalworking debris which now reside in a couple of museums. The north Yorkshire town of Hawes lies 3 miles to the west on the A684 and Aysgarth in the opposite direction is 6 miles, in what is a very beautiful part of The Yorkshire Dales National Park. The fort of Brough-by-Bainbridge lies on a low, round-shaped hill and measures roughly 99 metres by 80 metres (324 by 262 feet), an area of 1.06 hectares (over 2 acres), so quite a small Roman fort. Hardly anything survives of the inner structure ie annexe, military and living-quarters, or for that matter any associated stonework, though a 3 metre high earth and stone platform is still clearly visible outside the rampart’s SE side. The ramparts are in a good condition on three sides N, E, and S – at the west side 5 irregular spaced ditches survive, while at the north there are maybe 3 irregular ditches? And there were four gateways in the centre of each rampart. Almost certainly an ‘undefended’ civilian settlement (vicus) was established outside the fort in the 3rd century and, there may have been a regular market associated with this settlement, something that we still have in our towns today, according to Arthur Raistrick in ‘The Pennine Dales’, 1972. However there are no signs of the civilian settlement, at least not on the ground! The fort was occupied by legions between the early 2nd and the late 4th centuries; we know this from three Latin inscribed building and military-type stones found here that rebuilding took place after it was burnt to the ground in the early 3rd century AD – the rebuilding being carried out by the VI cohort of Nervi or Cohors Sextae Nerviorum. An earlier 2nd century timber fort was replaced by one made of stone, something that happened at many Roman forts in Brittannia. Archaeological excavations took place between 1925-26, 1928-29, 1950-53 and 1956-69 when 3 stones with Latin inscriptions were discovered along with a stone bearing a crudely carved mermaid and, also substantial amounts of metalworking material and ingot moulds. It is said there are Roman stones built into a number of cottages and farm buildings in and around Bainbridge. 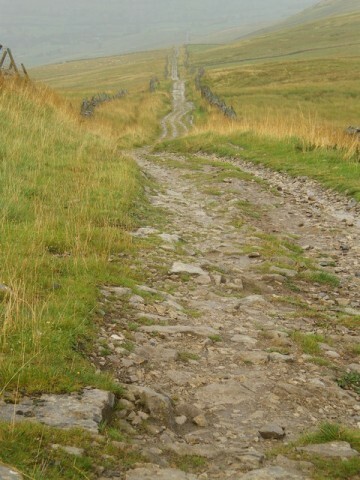 A resonably well-preserved Roman road which is known to walkers as ‘Cam High Road’ runs south-west from Bainbridge over Dodd Fell and on towards Bentham, Ribblehead and Chapel-le-dale, probably connecting up with the Roman road running south from Calacvm (Barrow-in-Lonsdale) to Ribchester (Bremetennacvm). 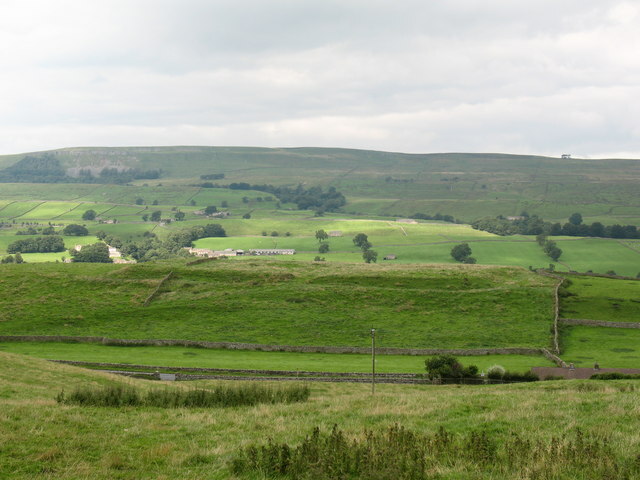 The nearest fort to Bainbridge (Brough-by-Bainbridge) is Wensley 12 miles to the east, though no Roman road connects to it. Photo Geograph: © Copyright Gordon Hatton and licensed for reuse under this Creative Commons Licence. Photo Geograph: © Copyright Tom Howard and licensed for reuse under this Creative Commons Licence. Raistrick, Arthur., The Pennine Dales, Arrow Books Ltd., London W1, 1972. Scott, Harry J., Yorkshire, Robert Hale Limited, London EC1, 1977. Bedoyere, Guy de la., The Finds Of Roman Britain, B.T. Batsford Ltd., London W1H, 1989. Categories: Roman Sites | Tags: Bainbridge Roman Fort in North Yorkshire, Brough-by-Bainbridge Roman Fort in North Yorkshire | Permalink. Maybe some sort of watchtower? Though it was not a very high tower!